Comprehensive set for use in any setting. 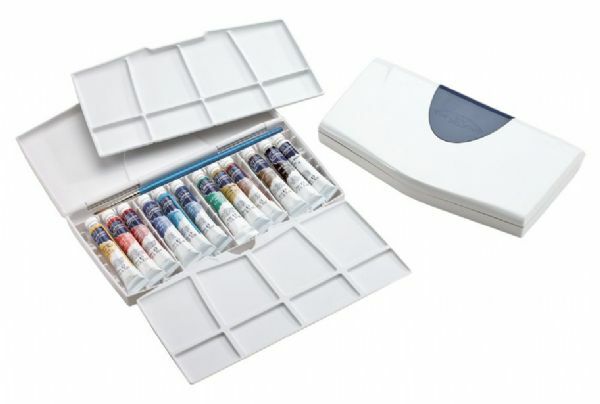 * Contains 12 Cotman fluid watercolor 8ml tubes plus a Cotman Series 111 #3 brush. * Three large mixing surfaces with multiple wells including clip-on palette and a removable palette for versatility and easy cleaning. * Set contains 8ml tubes in 12 colors: Cadmium Yellow Pale Hue Cadmium Yellow Hue Cadmium Red Pale Hue Alizarin Crimson Hue Ultramarine Cobalt Blue Hue Sap Green Viridian Hue Yellow Ochre Burnt Sienna Burnt Umber Chinese White. 8.4" x 5.75" x 1.15"